Do you dream of visiting Egypt but can’t seem to wrap your head around all of the logistics when it comes to planning your itinerary? Don’t let the chaos of planning a trip to Egypt get in your way of visiting this incredible country. Today, I’m going to provide you with two ways to visit Egypt and as hassle-free as possible. Firstly, have you heard about my PTM Egypt Tour? Yes, that’s right. 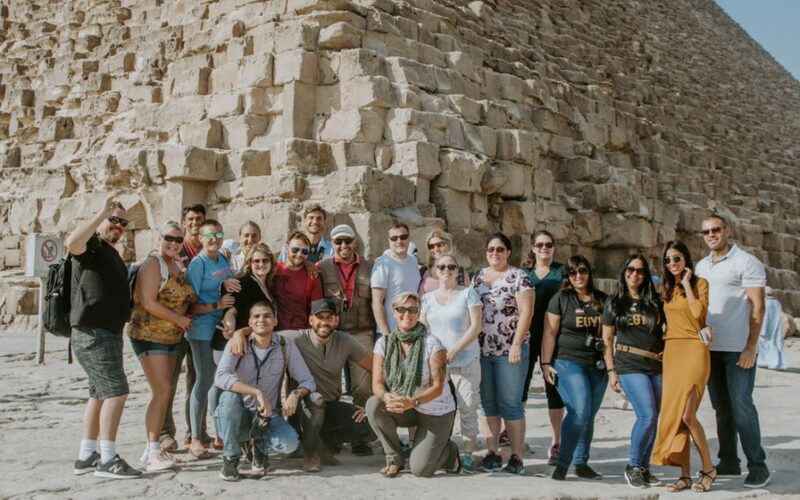 I’ve been running small group tours to Egypt since 2016 and we have another one coming up in October 2019. Can’t join my tour this year but still want to visit on your own and do your best to avoid all of the annoyances and hassles that come along with planning a trip to Egypt? Below, you’ll can find a short interview that I conducted with my personal Egyptian tour guide who I use not only when running my Egypt tours each October but also when I visit Egypt independently. In the Q&A below, you’ll get to learn a little more about my Egyptian tour guide and how you can reach him to being planning your upcoming trip to Egypt. Q: Which city/area of Egypt were you born in? Q: How long have you been a tour guide in Egypt? A: 12 years and counting! A: I have a Bachelor of Science in Guidance from Helwan University, one of three big Universities in Egypt – 2006. High diploma in Education System from Benha University – 2013. Masters degree in Museum Studies from Helwan University with cooperation between Egypt and Germany under UNESCO. I’m currently preparing for my PhD in Heritage and Museums Studies. 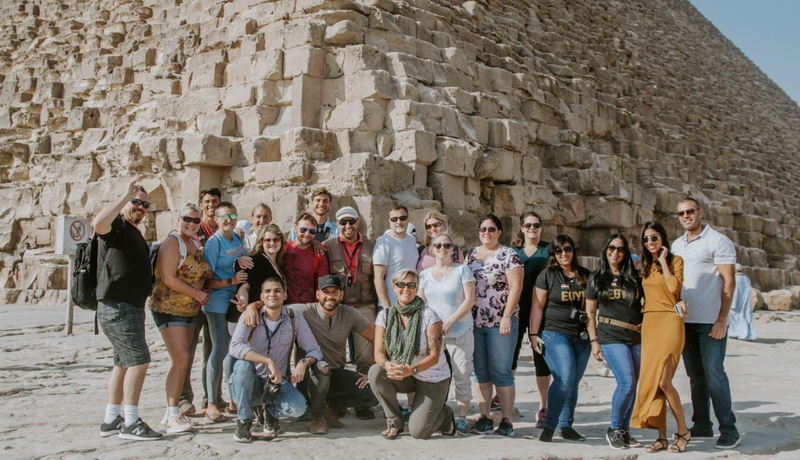 Q: What is your most memorable experience as an Egypt tour guide? A: I was once hired as a guide for the Prime Minister of India. There was a lot of press in India writing about me and my guiding of the PM. Also, I’m very proud of my work with the United States embassy. Q: If you could recommend two traditional Egyptian dishes to first time visitors to try which dishes would you recommend? Q: Do you offer single day tours in Cairo? Q: Do you offer private group tours? Q: Do you offer transportation to and from Cairo International Airport? Q: What type of transportation do you offer for your Egypt tours? A: All types of transportation from private cars to vans and tour buses. Q: If a tourist had 3 days in Cairo, what would you recommend they visit? Q: What are three things every tourist must bring on your tour? A: Sunglasses, camera and a scarf to cover your skin from the scorching hot sun here in Egypt. Q: What is your favorite (local/non-touristy) restaurant in Cairo? Q: What is your favorite cafe in Cairo to drink tea, smoke shisha and people watch? Q: Where is the best place to watch the sunset in Cairo? A: Beside the Pyramids of Giza, from a felucca on the Nile or from Mokattam Mountain. Are you in need of a tour guide to help you plan your trip to Egypt? If so, please reach out to me and I’ll do my best to set you up with my guide, Mohamed. These are good recommendations for a guide. we can get perfect guide with help of this post. Thanks! interesting questions for a guide. Thanks so much for this post! Now, what months (weather purposes) are best to visit Egypt? No problem. The best times are usually Oct/Nov/Dec when the weather is a bit cooler. Does he speak good English? Yeah, I have a guide for you that speaks fluent English. Shoot me an email and I’ll be in touch with you asap. Please reach out to me at pausethemoment@gmail.com and I’ll refer you to my business partner in Cairo. Thanks!